Goest Perfumes Dauphine Fragrance Roller - This niche perfume brand has caught my eye with their minimalist packaging and unique scents. Out of all of their fragrances, Dauphine sounds the most appealing. Notes of rose, musk, almond and cream? Sounds like the most decadent dessert I've never eaten; count me in. 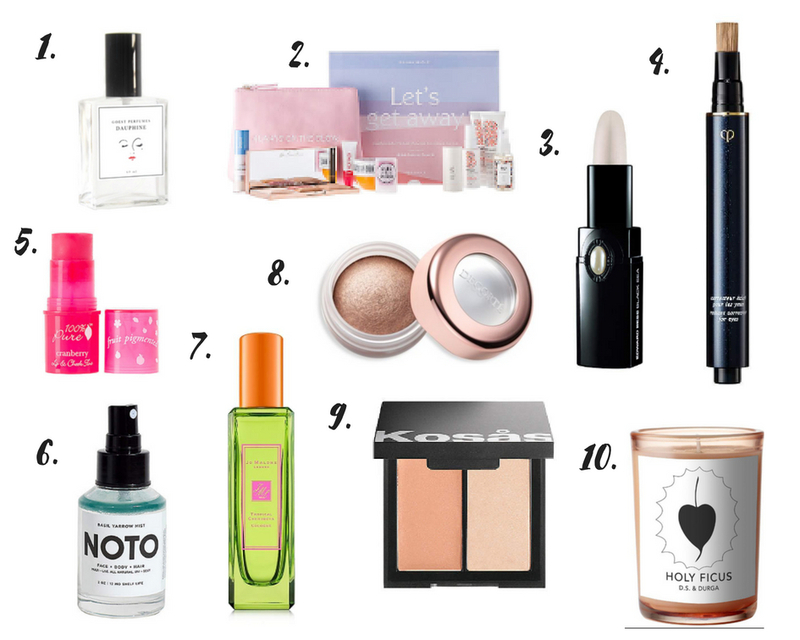 Revolve Beauty x Marianna Hewitt LET'S GET AWAY Beauty Box - I trust beauty guru Marianna Hewitt's opinion on makeup, and I definitely trust that she knows which of her favorites are ideal for travel, too. This box offers so much for the money and takes the pain out of packing your beauty products for you. Summer travel, take that! Edward Bess Precious Pearl Undereye Illuminator - How chic is this lipstick-like tube of eye illuminator? I can already picture myself taking it out of my bag and swiping it under my eyes for a quick mid-day makeup refresh. Clé de Peau Beauté Radiant Corrector for Eyes - For the past year, I've almost exclusively used the Clé de Peau cult-classic concealer for my under eye area. However, I'll be the first to admit that sometimes, when my skin is dry, it can look a bit heavy in the eye area (still perfect for blemishes), so this new cream corrector seems like it will fix that issue! The concealer gods have smiled down on us with this release, you guys. 100% Pure Lip & Cheek Tint - I can't take my eyes off of this hot pink-hued lip & cheek tint. I've never tried anything from the brand 100% Pure before, but it seems to be popping up everywhere lately! I love a good multi-purpose product and think I'll be ordering this to pop in my handbag this summer. NOTO Botanics Basil Yarrow Mist - An energizing, aromatherapeutic toner for hair, face and body? I'll take two. This basil, yarrow, and rosewater mist sounds so refreshing, I imagine I'll be spraying it everywhere, all the time. Jo Malone Tropical Cherimoya Cologne - If it's Jo Malone, chances are I'm going to lust after it, but this Tropical Cherimoya Cologne really seems like a must-have. Passion flower, juicy pear and warm notes of tonka bean sound like the making of their dreamiest summer scent combination yet. Decorté Eye Glow Gem Glossy Eye Color - I'm not sure if I'm late to the party, but I've never heard of this brand before. When I wear eyeshadow, I like it to be metallic and have an illuminating sheen, and this looks like the ultimate product for that. I also have to mention, it's bouncy in texture, which makes me even more intrigued. Kosas Color and Light Creme - This cream bronzer and highlight duo is all natural and looks like the most beautiful pale color combintion. I am not a fan of a muddy bronzer, so this seems like an ideal color for me...plus, I've heard nothing but good things about this product. D.S. & Durga Holy Ficus Candle - Hi, I'm Corinne and I'm a candle addict! This one piqued my interest because my HG note, fig, is the star of the show, yet it seems like an even more special scent with additional notes of ginger and saffron.